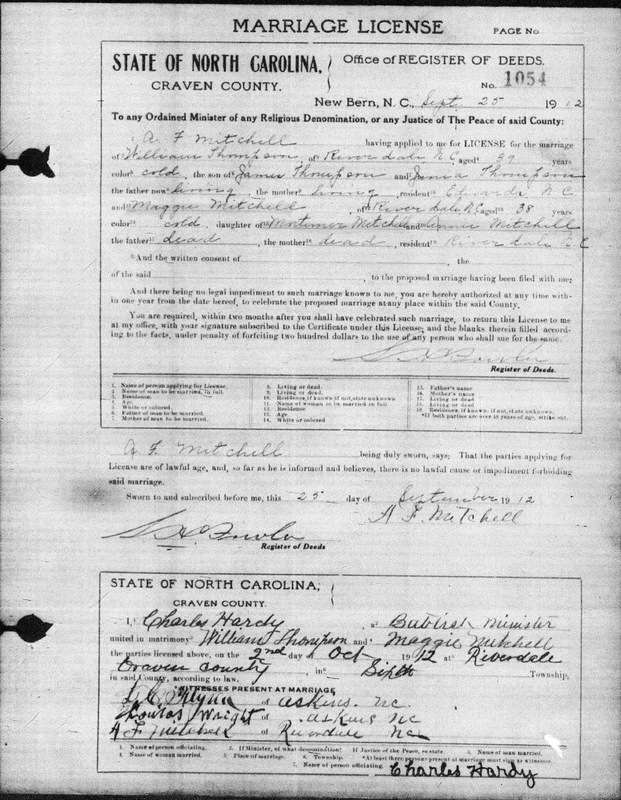 Thankful Thursday: Thankful for the North Carolina Marriage Records On FamilySearch.org. I have to say that tonight I am very thankful for the North Carolina Marriage records that are now available on-line on FamilySearch.org. I have been having a blast looking at either the register or an actual images of marriage records or licenses of some of my ancestors tonight. I even found a mistake on my family tree where I had someone listed as a child of a 2nd great grand uncle and in fact they were siblings. Pretty cool! My 2nd great grand uncle Alfred F. Mitchell applied for the marriage certificate for Margaret "Maggie" Mitchell, his sister, and her second husband William Thompson. Previously, I was under the belief that Margaret was Alfred's daughter but this document helped to clear up the mistake I had on my tree. Also, by finding this information, I realized that Margaret in fact wasn't buried in Bertie County but rather she was laid to rest in the same cemetery that many in her family were buried at in Riverdale, Craven, NC. She's at rest in the old cemetery located behind Mt Olive AME Zion Church in Riverdale under the name Maggie Thompson. I am glad that I now know this but I am kind of wishing I had found this out before I made a trip to New Bern and Morehead City back in January. When I visit North Carolina again, I will have to make a point of finding her grave and taking a picture.